Defensor? Yes, I am talking to you. Someone needs to save HUELand and YOU ARE THE CHOSEN ONE. Yes, you. Only you can structure our defenses. Why? Just because. And don't complain. In defense of HUELand, a natural paradise with the most complex and corrupted government systems int he world, fight against corrupt politicians and their supporters - whether at borders, fields or cities. 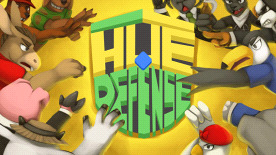 Customize your defensive strategy with several upgradeable towers and enhancements. Campaign with 24+ unique stages.